Whether you smoke cigars or not,you're in for a musical treat when Dave's trio starts playing. No admission or cover charge! A whole bunch of great jazz music! Dave's Hardbop Quintet is ready to pull out all the stops! Three smokin' sets of "straight-ahead jazz! Lots of street and garage parking close by. Lots and lots of great jazz! No admission or cover charge. Come early and stay late!! If you haven't decided on a cool venue to take mom to on "Mothers' Day", this is it. And if you're not taking mom anywhere, this is still a cool venue! Sam's offers amazing seafood cuisine, an ocean view, full bar, spacious indoor dining,and open-air deck space. 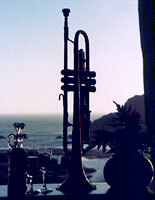 That's where the quartet will be playing,outside on the deck, stoking up some heavy latin, funk, and jazz grooves. The music is guaranteed to put a smile on your face (and mom's too). The "Hardbop" Quintet will be in top form for this one! Come early and stay late, to enjoy some fantastic jazz played by some of the best musicians on the west coast! Ample parking in the area. The hardbop quintet will be in top form. Come early for a table close to the bandstand. Lots of parking close by.